Graz, the second largest city in Austria, is a university town, and its Old Town is one of the best preserved city centers in Europe. Added to the UNESCO list of World Cultural Heritage Sites in 1999, Graz was the Cultural Capital of Europe in 2003. If you’re thinking of visiting this charming Austrian city, take a look at our list of the best hotels to stay. Less than a mile away from Graz’s city center, the Augarten was built by the famous Austrian architect Gunther Domenig. It’s a four-star hotel with superior design and a focus on art – there are over 200 pieces of contemporary art inside the hotel. The hotel has a 24-hour leisure zone with a sauna, fitness room and an indoor pool. WiFi is free in the hotel and most of the rooms have a view of the Clock tower. They offer business rooms, medium and large double rooms, a penthouse suite and apartments, perfect for families and extended stays. All rooms are beautifully decorated with unique artworks on their walls. They use fresh, regional and organic ingredients in their breakfast and offer a selection of international papers. Located only fifteen minutes away from the city center, the Roomz Graz is a modern design hotel. The rooms are all bright and have flat screen TVs, free internet access, telephone, desk, air conditioning and a safe. The hotel has its own restaurant with an affordable a la carte gourmet menu where food is served until 10pm, and it also has a bar and a lounge. Every morning the young and dynamic team serve an international breakfast buffet. If you want to stay in an exquisitely designed modern hotel without having to pay luxury prices, this hotel is a great option. 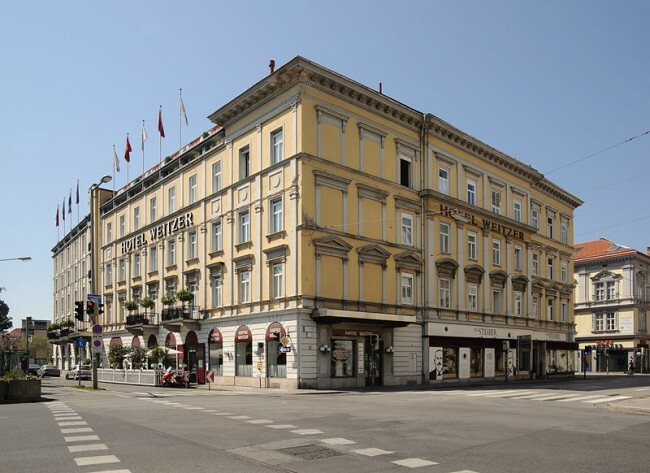 A modern hotel with individually designed rooms and apartments in the heart of Graz, Hotel Gollner is located only two minutes away from the Opera House. The hotel has different types of rooms for different prices so that you can find the perfect choice for your stay, and there are also city apartments. The rooms have free Wi-Fi, cable TV and soundproof windows for a peaceful stay. They offer a rich breakfast buffet which can be served on the terrace during the Summer or in the breakfast room during the Winter. Come and experience Austrian hospitality at this four-star hotel offering five-star service. With quiet rooms, friendly staff, free wifi and a shared lounge where you can get coffee and beverages, this lovely Hotel B&B is only ten minutes away from the Old Town. The offer rooms for groups of 2, 3, 4 and 8 people. The stylish rooms have private bathrooms and include all the desirable mod-cons. Breakfast is served at the partner café across the street and adding breakfast to the room price is optional, so that those who want to have breakfast outside of the hotel don’t need to pay. On Sundays they offer a small ‘city breakfast’ for free, which includes a hot beverage and croissants. This hotel enjoys a quiet location in Graz’s countryside, right under the Saint Martin Castle and just a few minutes from the city center. The Paradies features tennis and squash courts, an outdoor pool and a fitness center, a sauna, a steam bath and an infrared cabin. Free parking is available, and the hotel has its own restaurant with a beautiful terrace where regional and international specialties are served. Check out the wine list to sample some of the best regional wines. A great choice for travelers interested in sightseeing and exploring the Old Town, Das Weitzer, close to the Kunsthaus, Schloßberg and Murinsel, is one of the most famous hotels in town. The hotel offers stylish rooms for different budgets, all with free Wi-Fi, flat-screen TVs and air conditioning. The hotel features a well equipped fitness studio and a Finnish sauna on the top floor. A rich buffet breakfast with home-made specialties is available for an extra charge is served in the stunning Engelreich room. They also offer a bike rental service for those interested in exploring the city by bike. Offering self-catering accommodation, Studios + offer an alternative to traditional hotels for those visitors wishing to be more independent during their stay. With free WiFi and garden views, each studio has a large living area, a kitchen and a bathroom. You’ll be able to rent bikes to explore Graz or stay in and enjoy the lovely garden outside. The studios are situated 900 meters away from the Stadthalle. The complex is beautifully designed, with studios which are tastefully and elegantly decorated and yet retain a homely feel. Located right in front of the Technical University of Graz, Cityview offers a studio apartment with a balcony which offers views of the Schlosseberg mountain. The apartment is equipped with a double bed, a sofa and a flat-screen TV, a bathroom (towels are provided), a fully equipped kitchen and a dining table. The studio is designed in an elegant minimalist style. Guests can get to the city center by tram, and there are a few restaurants and cafés nearby. Situated right by the Mur River, this modern and spacious Hotel Wiesler is exquisitely designed. The rooms are bright and incredibly spacious for a hotel, and they feature contemporary urban décor with some vintage touches, resembling stylish design flats. There are different types of rooms for different prices, all uniquely designed. The hotel offers different elegant meeting and events rooms, bright and spacious just like the guest rooms. The hotel also has a fitness area and a steam bath and sauna. The Speisesaal is the hotel’s restaurant, a chic space where meals are served with fine soul music in the background. They serve lunch, dinner and snacks, and guests can have breakfast here everyday which can be turned into brunch on the weekend. This is definitely the trendiest hotel in Graz. Located next to the main train station, the Daniel Graz welcomes guests with a colorful and homely atmosphere. Designed by Florian Weitzer, the hotel offers modern guestrooms which are functional and feature innovative designs. They offer two different types of rooms from 64€ and 81€, but its most outstanding feature is the 44 square meters LoftCube placed on top of the hotel which provides panoramic views of the city. For an extra charge you’ll be able to sample one of the best breakfasts in Graz. Free WiFi is available and the hotel gives guests the opportunity to rent bikes as well as Vespas or the Piaggio Ape to explore its surroundings.